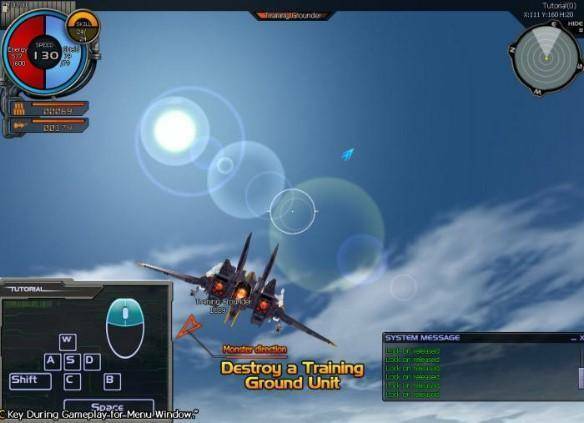 Ace Online is a Free to play MMO Space Shooter genre game developed by MasangSoft for Windows. In Ace Online each player is the pilot of their own high speed fighter (known as a Gear) in this action packed, futuristic, free to play space shooter that has full MMO capabilities and enhanced 3D graphics. Set on the distant planet of Philon in the future players battle it out as one of two factions, taking to land and sky in their Gears and fighting over a myriad of exotic landscapes; from canyon gorges, icy caves, treacherous jungles and snow-capped mountains. Each Gear can be completely customized to match the players preferred style of play, and can take to the sky 1 v 1 duels with other players, compete with allied faction players to be recognised as being the best, or go for all-out war against your rival faction. The two factions are highlighted by the thin storyline the game is centred around; the two rival nations of Arlington City (ANI), a rebellious empire that are locked in war against the imperials of the Bygeniou City United (BCU). Engage in epic battle and slowly improve your flying capabilities, prove yourself with your chosen nation and complete missions for them; in return you will receive new tech and superior weaponry to further aid your people. There are four different variations of Gears that players can choose from, each of which has their own specialization with their own pros and cons, depending on the situations they find themselves in and which enemy Gears they go up against. The A-Gear has the capability of landing on the ground then using its Drive ability as well as turning into a powerful anti-aircraft turret with its Siege Mode, particularly useful when going up against I-Gears; high acceleration and top speed they are nimble and acrobatic and difficult for other flying Gears to go up against. B-Gears are “Shotgun” ships, able to do powerful burst damage they focus particularly on Ground and Air Bombing capabilities. Finally the M-Gear has extremely high defence and its Reverse Engine ability, focusing mainly on buffing and supporting companion Gears. Players can assemble in strategic formations with their peers and fly into battle going to head to head with their enemies, with thirty or more players you can create a Brigade and work together to try and top the leader board. The ultimate goal for many is seen in the Leader System, where players can run as “President” and become the leader of your nation, gaining political, economic and diplomatic power to help run your empire.